So January '14 again opened on a strong note and managed to end above 6000 levels. 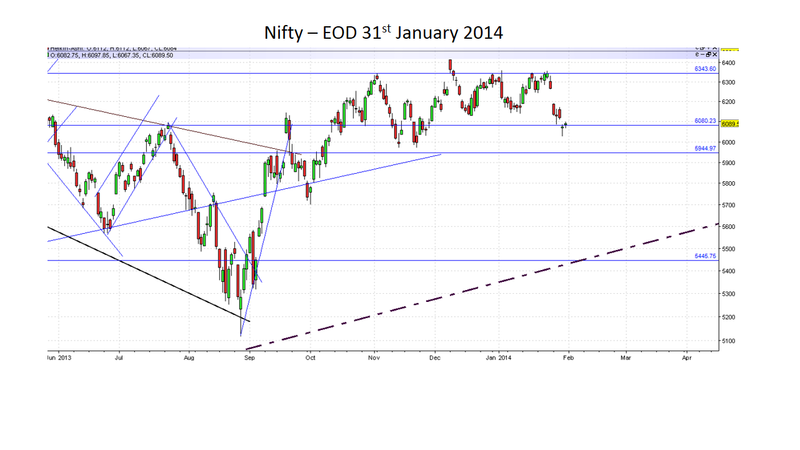 As mentioned earlier, until elections [or a Black Swan event from abroad], Nifty will be range bound. 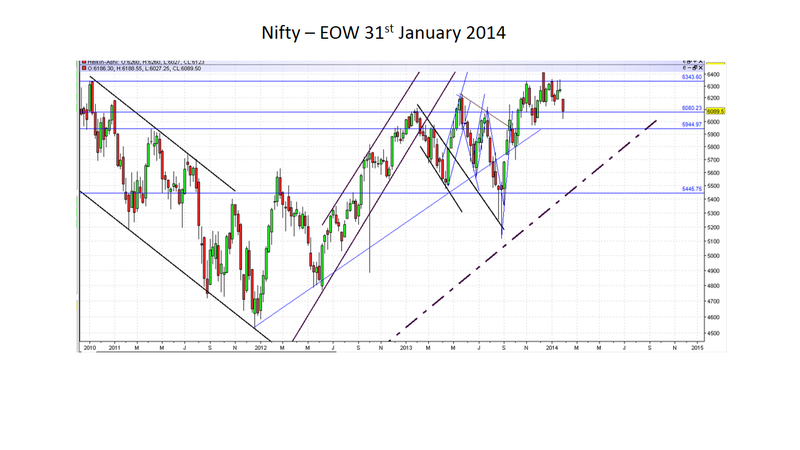 The broad range is 5944-6415 whilst the trading range will in all likelihood move around 5970-6350 levels. One needs to be patient and buying near 6000 levels and selling near 6350 levels is what one can do on the Nifty. 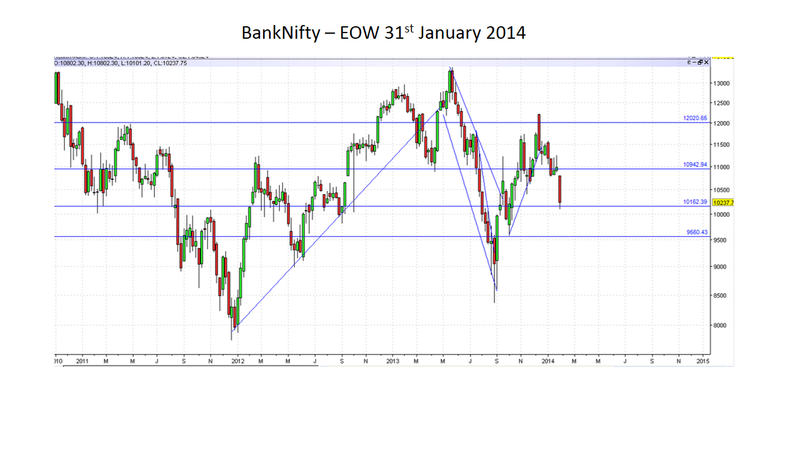 The disappointing part was BankNifty which could not hold 10400 levels in Jan '14. This makes a test of 9600 very likely in Feb series from where a strong bounce should come through targeting 11200 levels. 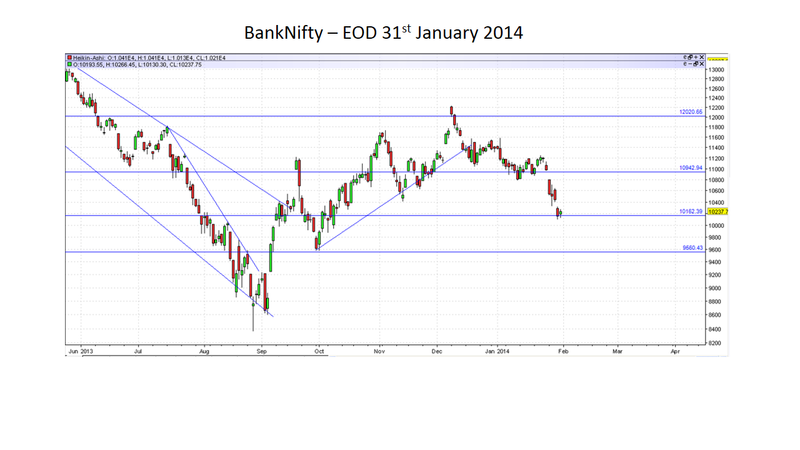 From a longer term perspective, BankNifty is providing very good buying opportunities, especially SBIN. In all likelihood, it should form a base around the 1450 zone and start the upward movement. The longer term target remains 2750 for this stock. Just as was the case with Tata Steel when it fell relentlessly from 475 to 200 and then bounced back to 425 levels in a jiffy, a similar pattern may play out in SBIN. The bounce from 1450 to 2050 should play out rather quickly in the near term. One should use these falls to buy into such stocks. A lot of people are still harping around the IT theme. There is no doubt that the IT pack has delivered stellar returns but the premise that they will continue to do so seems highly unlikely. However, since most of these IT counters are near 52 week highs, one should not jump to short these counters. Historically, when stocks make 52 week highs, shorts get squeezed and the very short-covering propels them a few percentage points higher. Rather those who are long IT should slowly trim the long holdings and bank some of those gains. As far as the pending bull market rally is concerned on Indian bourses [post-elections] it will be the banking counters, capital goods and mid-cap stocks that will provide opportunities. That's how a secular bull market plays out i.e. strong currency, credit based bank growth and infrastructure and capex cycle movement. It is very difficult to pick up individual names in the mid-cap counters as regular large cap circuits don't work on them. Overnight they appreciate/depreciate 40%-50%. So one is better off with index based ETFs like JuniorBees, InfraBees, M100 etc on SIP basis. As far as my trading calls are concerned, you can see them on the twitter feeds on the top left hand side, updated with about 3 to 5 calls in a week. On the blog, I will be only advising buying opportunities now as I feel that we are on the cusp of a major bull market and investments are a much better option. As I keep saying that the bond markets are a pre-cursor to what one can expect in the equities space. The growth of the institutional bond markets [mortgage backed securities] and soon we can expect asset backed securities in the transportation space. All this is pointing towards a gush of liquidity emerging slowly [contrary to media reports of Fed taper, Bond Yields on RBI treasuries etc]. Once the election is out of the way and a stable government comes through, currency space will see a lot of upside for the rupee-dollar and the bond market money will pour the much needed liquidity in a lot of equities. Mainstream media is always late to the party IMHO. Gold/Silver: In rupee terms, a bottom seems to have formed and now a base building exercise is on-going. Due to the dual dependency i.e. dollar price and exchange rate, prices seem to confuse at times. The way I look at it, by the time currency appreciation in rupee happens, the dollar prices will runaway upwards and hence in rupee terms, not much negative impact is anticipated further in India. Crude Oil: Prices will continue to hover around the 90 dollars / barrel mark but in rupee terms, we can expect petrol and diesel to cross over the 3 digit mark within the next 3 years. The overall market structure seems poised to move into a strong inflationary period and one needs to be geared up to ensure that investments are made in the right areas. Hot money is gearing itself up in every area of middle class needs i.e. food, education, entertainment and in fact is spreading tentacles to wipe out maximum purchasing power.